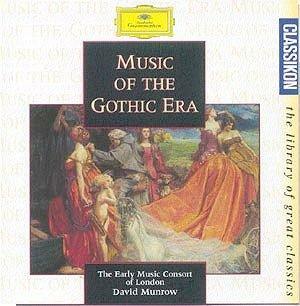 Music of the Gothic Era Early Music Consort (David Munrow) DG Classikon 4690272 60'31"
A difficult one, impossible to give a single star rating. A marvellous nostalgia trip for those of us who were in on the excitements of the early music movement in the '60s & 70's. David Munrow was a marvellous virtuoso performer on his huge collection of exotic instruments, and a communicator both on radio (Pied Piper for children's radio - never talking down to them) and in his programme planning. Never just a list of items, he devised cunningly balanced sequences, varying the singers & instrumentation, with everyone staying on the platform for seamless continuity, to make it a real party. This was one such programme of the many memorable evenings in the Queen Elizabeth Hall, before Munrow's untimely suicide, after which the torch was passed on to more serious minded scholar-musicians. Early music seems to be good for the vocal health, because most of these singers, recorded in 1976, are still fully active on the scene, James Bowman perhaps the most famous. Regrettably the instrumentalists are not listed, though there was plenty of space to do so. It covers mid-1100s to late-1300s, Perotin to de Machaut, monody to complex three part motets. There are bells, shawm, mandora, psaltery, fiddle & tabor and, to end, the braying of cornetts; a feast of contrasting timbres, some of them possibly anachronistic. It all sounds great, if no doubt dated according to later research, when things became more austere. Excellent recording and CD transfers. No notes at all provided on the individual items or composers however with this Classikon re-issue from the Deutsche Grammophon back catalogue, which is full of treasures. Good value at the price certainly, and a happy hour's listening - you may even find it refreshing for once not to have to cope with the usual historical information? But, these being days of the information explosion, it would be good if Deutsche Grammophon considered putting the text and pictures from the original LP box onto their website, with biographical notes about David Munrow for those too young to have seen & met him, and certainly to include the members of the Early Music Consort, many of them still household names twenty five years on.